This meal was a HUGE winner in my book. 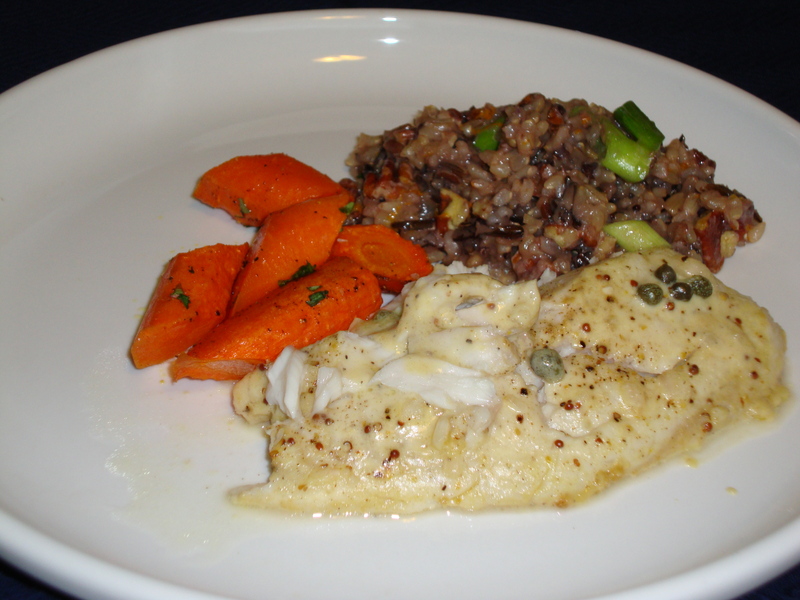 I was looking for a fairly easy fish recipe, and found this one from Barefoot Contessa: Mustard-Roasted Fish. 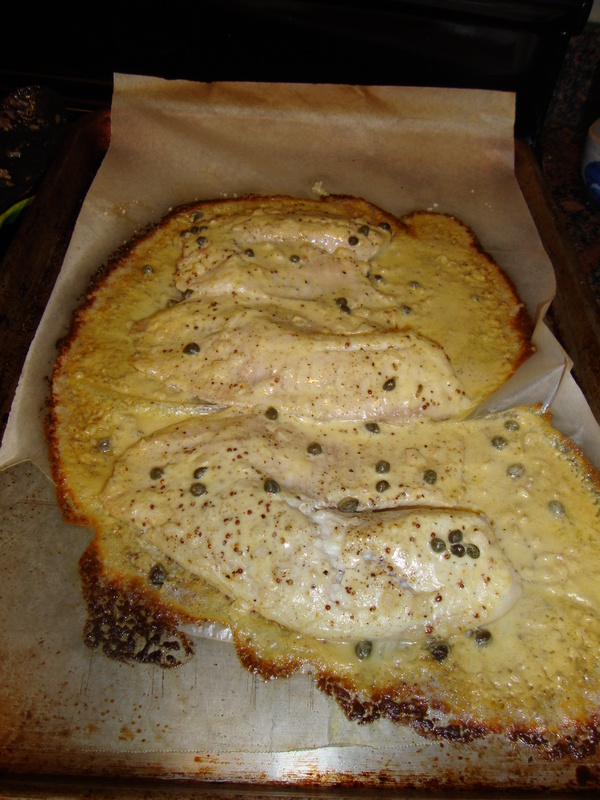 I loved that you cook it in the oven (no fishy house smell), and I’m a big fan of mustard, capers and Barefoot Contessa so I went for it. Now, cooking fish can be scary — it’s so easy to overcook and turn the fish into a tough, chewy disaster. But don’t let that deter you. This is super easy, and when you’re cooking in the oven it’s easy to test the fish a few times to make sure you’re not overcooking it. So…about this fish. Basically…it was absolutely delicious. It was so moist it practically melted in my mouth, and the sauce on top, made up of creme fraiche, two types of mustard for a great tang, shallots and salty capers, was perfect — creamy yet light, and with such a great mustard flavor. I’m in love with it. I’ll be making this again. Maybe next week. Seriously. 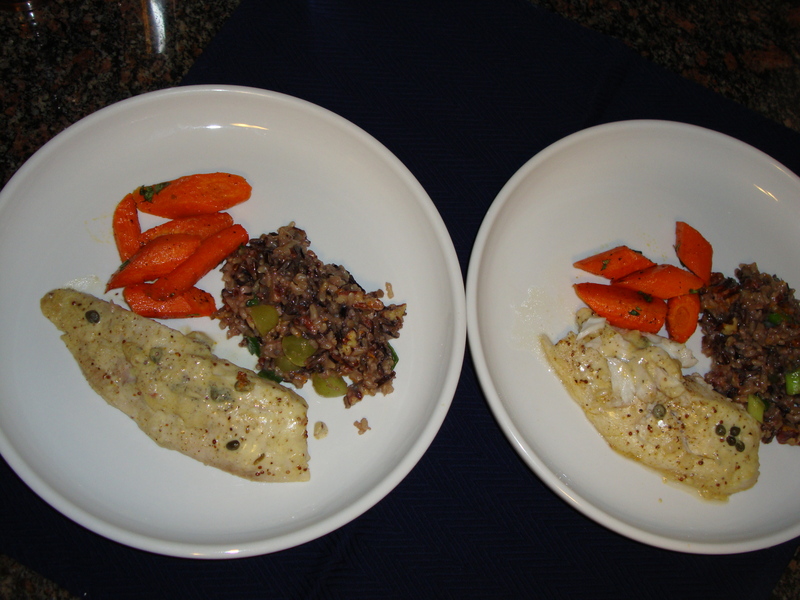 I paired the fish with a fancy wild rice, also by Barefoot Contessa, that incorporates grapes, scallions, orange zest and pecans for some nutty crunch. I’m not a big rice fan — I tend to find it boring unless it’s soaking up some delicious curry sauce — but now that it has been a part of my two latest posts (check out the mango-basmati rice salad in my last post) I realize you may not believe me! Let’s suffice to say that this rice has enough going on to make it interesting. In fact, when my friend Kim and I were eating this, I commented that I could eat the rice on its own for a meal — it was that good. And then the carrots. I’m a big advocate for roasted vegetables. 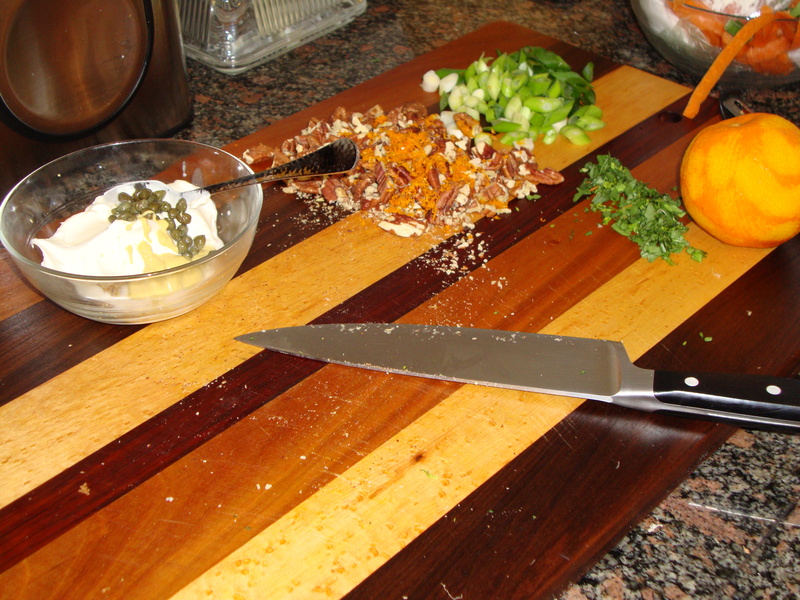 It adds such a nutty, delicious flavor to the vegetables while keeping a good firmness (no mushy veggies here). They caramelize under the high heat, adding a little sweetness…yum. I didn’t have any parsley or dill (I thought I did, but then I didn’t…bummer) so I used tarragon — not the best replacement, and I would definitely go for dill next time around. I was cooking for two, so I cut the recipe in half; even then I still had a couple of meals of leftovers. I also cut the carrot recipe in half, and probably should have done the same with the rice! 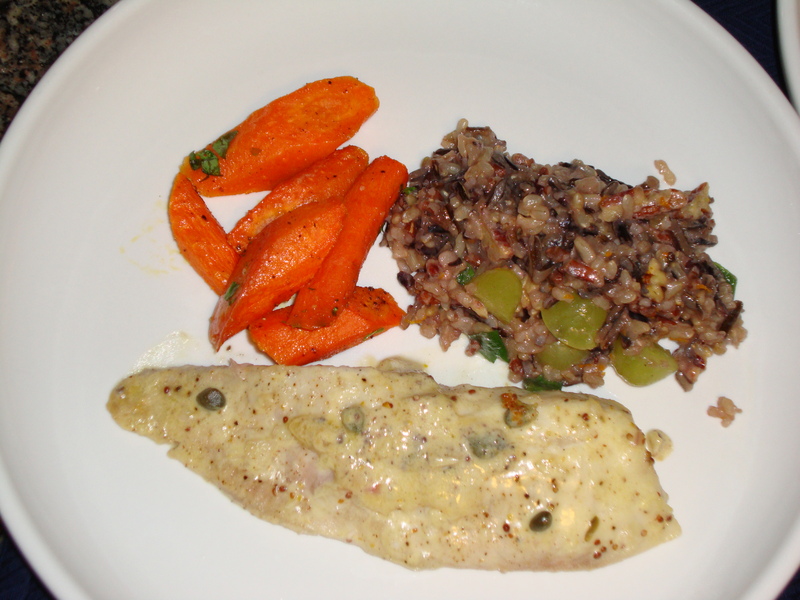 I used tilapia for my fish — any white fish works. Mine also didn’t have the skin — worked just fine. 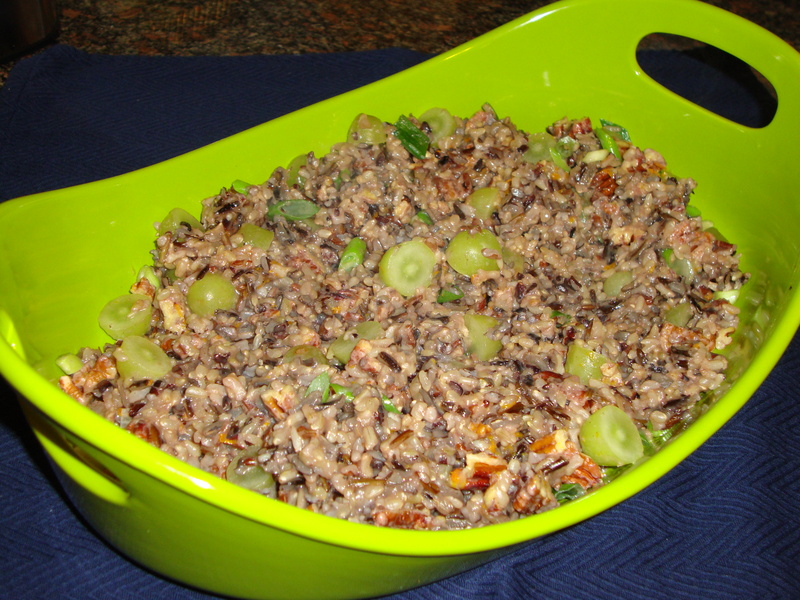 Buy your wild rice from the bulk section at the grocery store — I got the “mixed” type. Make this! You’ll thank me! Line a sheet pan with parchment paper. (You can also use an ovenproof baking dish.) 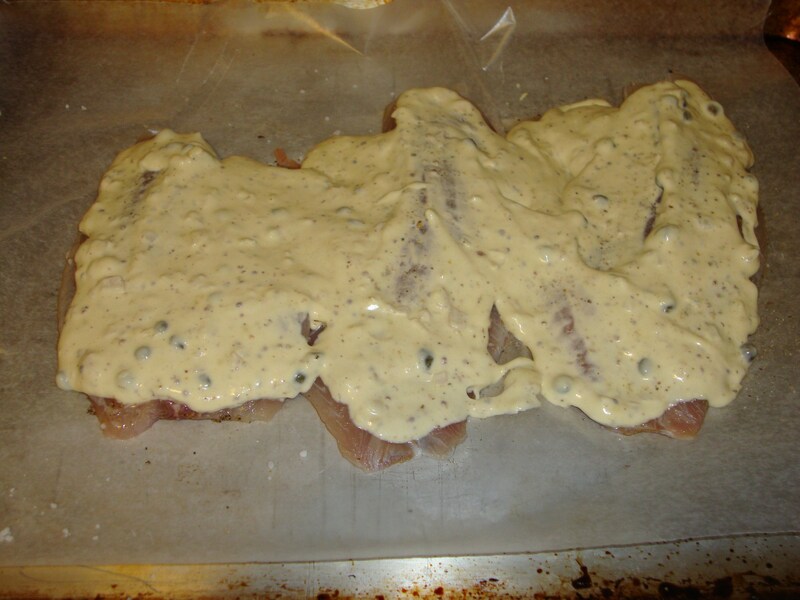 Place the fish fillets skin side down on the sheet pan. Sprinkle generously with salt and pepper. Combine the creme fraiche, 2 mustards, shallots, capers, 1 teaspoon salt, and 1/2 teaspoon pepper in a small bowl. 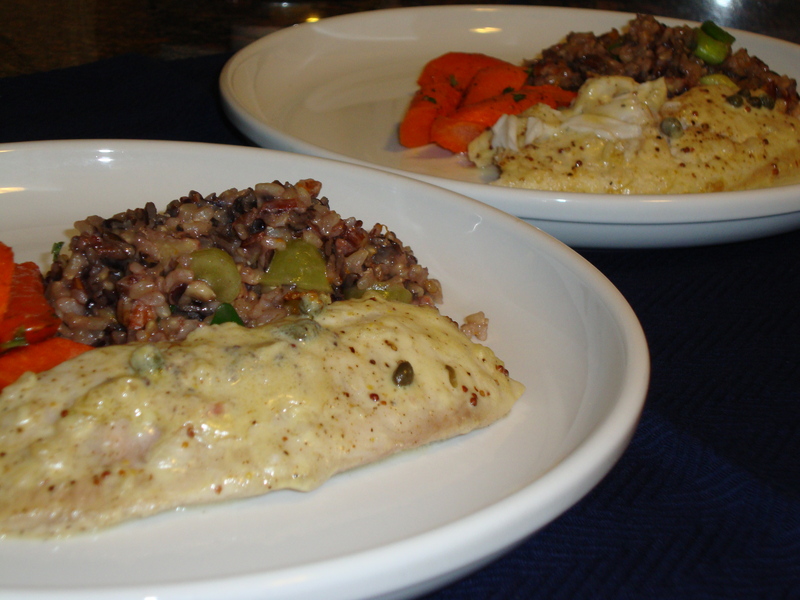 Spoon the sauce evenly over the fish fillets, making sure the fish is completely covered. Bake for 10 to 15 minutes, depending on the thickness of the fish, until it’s barely done. (The fish will flake easily at the thickest part when it’s done.) Be sure not to overcook it! Serve hot or at room temperature with the sauce from the pan spooned over the top. Place the rice, chicken stock, 1 1/4 cups water, 1 tablespoon butter, and 1 teaspoon salt in a medium saucepan and bring to a boil over medium heat. Cover the pot and lower the heat to simmer (pull the pan halfway off the burner if you need to) and cook for about 1 hour, until the rice is tender and the grains begin to burst open. Stir the rice occasionally while it’s cooking, scraping the bottom of the pan to prevent it from sticking. Turn off the heat, and allow the rice to steam for about 5 minutes. 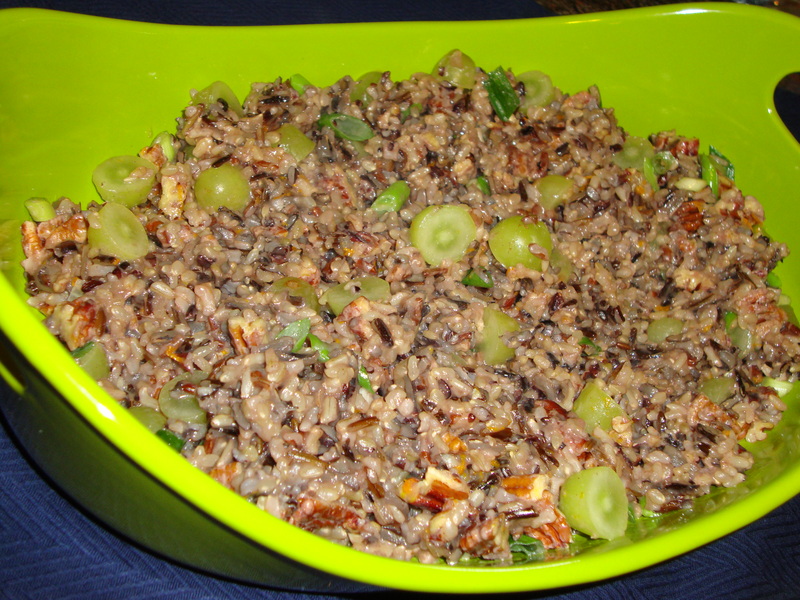 Stir the remaining tablespoon of butter into the rice, then add the grapes, scallions, pecans, orange zest, orange juice, 1 teaspoon salt, and the pepper and toss well. Taste for seasonings and serve hot. 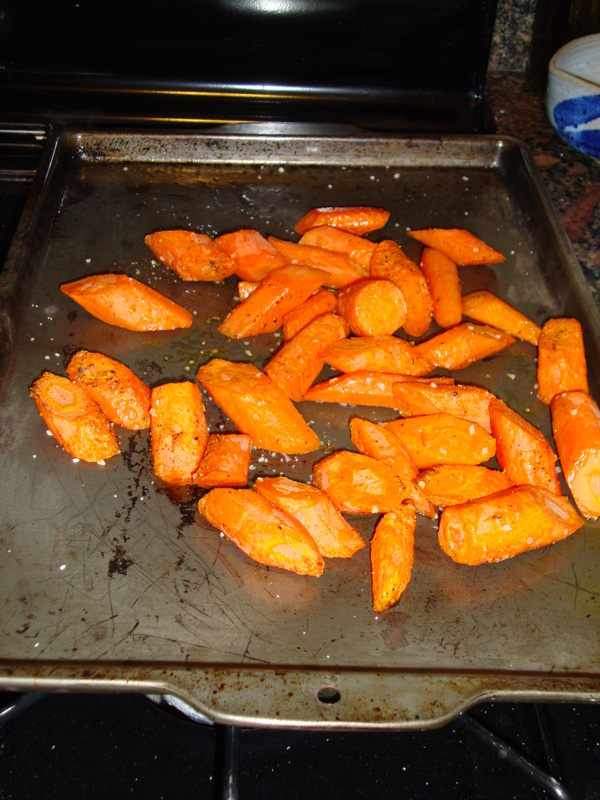 If the carrots are thick, cut them in half lengthwise; if not, leave whole. 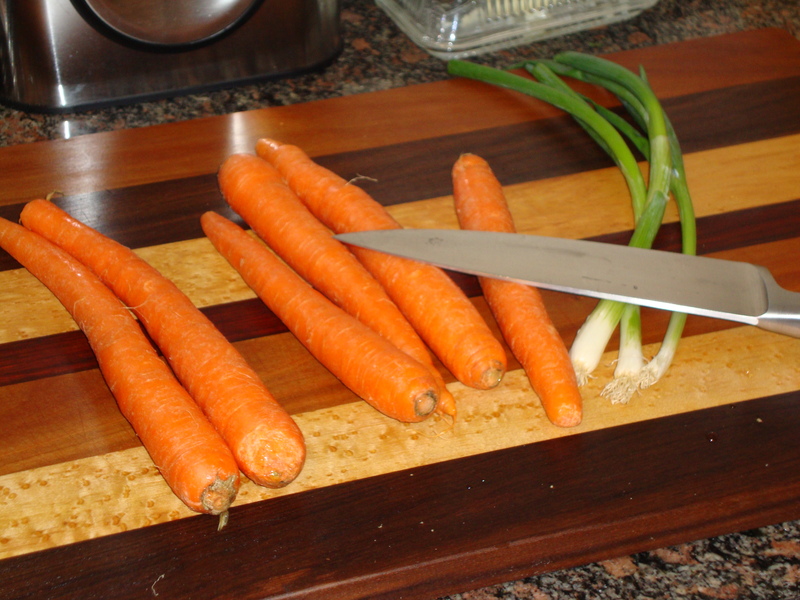 Slice the carrots diagonally in 1 1/2-inch-thick slices. 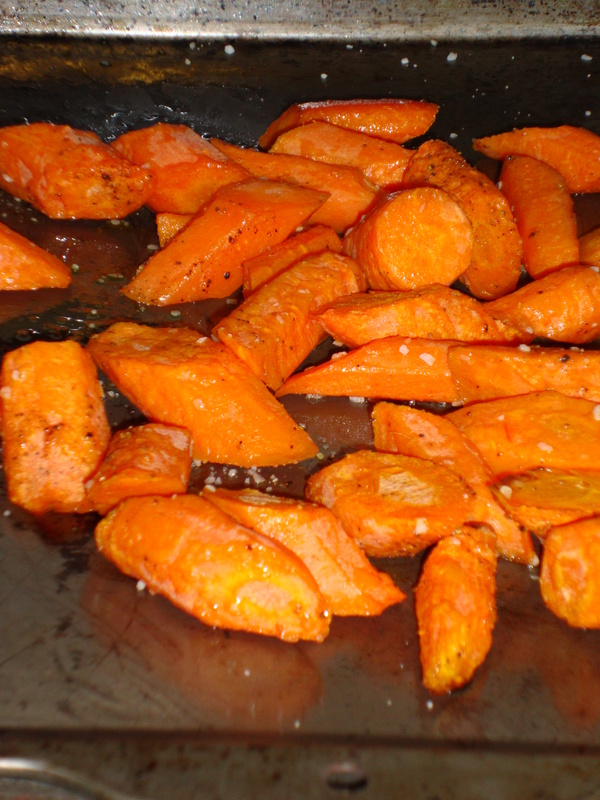 (The carrots will shrink while cooking so make the slices big.) Toss them in a bowl with the olive oil, salt, and pepper. Transfer to a sheet pan in 1 layer and roast in the oven for 20 minutes, until browned and tender. Toss the carrots with minced dill or parsley, season to taste, and serve.